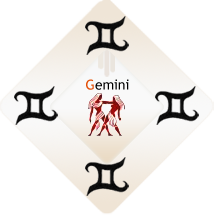 Gemini is one of the three human signs, illustrated by a person rather than some other kind of critter. And when a human appears, he/she appears in a pair. Isn’t that interesting? This comes with a question: what are the two sides of your nature? You’ve obviously identified a tendency to what’s called ‘dualism’ — the simultaneous expression of opposites.